A member of the European Parliament Committee who are in Dublin today to discuss the bank bailout said while Ireland has a case to make, so does every other country. 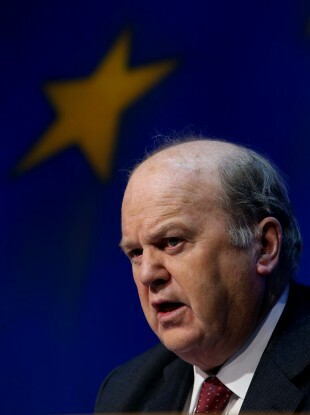 Minister for Finance Michael Noonan. A MEMBER OF the European Parliament Committee who is in Dublin today to meet with Finance Minister Michael Noonan to discuss Ireland’s bank bailout has said retrospective recapitalisation will be a “very hard bargain” to negotiate. Torvalds, however, was cautious in giving any indication as to the thoughts of the committee on the matter stating, they would be “very careful” as to what they say here, as one of the problems at the beginning of the crisis is that “we lived in illusions and I wouldn’t want to start another illusion”. When pressed on the matter he said that their minds were not closed to the matter, adding “you have a reasonable case” but said “Cyprus has a reasonable case, the Greeks have a reasonable case… everyone has a reasonable case to be made”. If Ireland is going to try and negotiate this thing, it is going to be a very hard bargain. Torvalds said all the countries came into the bailout programmes under “different trajectories” adding that Europe was “under stress” and the Irish government was under time constraints, meaning things did not go “as a fairytale, to put it mildly,” he said. He said the committee wanted to try and investigate what went well under the bailout programme, what went wrong and how another crisis like this might be handled in the future. Speaking about Ireland he said that the Irish problem was that “after Lehman brothers Ireland was the second station in the crisis and everyone was scared to death for contagion, therefore they were probably harsher in the beginning… ” than they were in respects to bailout programmed to other countries like that of Cyprus, he said. Email “Government makes case for retroactive recapitalisation to European committee”. Feedback on “Government makes case for retroactive recapitalisation to European committee”.